The winner was announced after the Grand Prix screening, Saturday, October 13th at 9PM. and the films submitted in 2013 for consideration in the Short Shorts category. A scientist invents a machine to control space and time. A man cries metallic tears because of a broken heart. Gas station attendant tries to work his night shift. A gentleman entangled with an expressive punk culture. Two unnamed duelers battle on a Brooklyn rooftop. Our selection of films for you to watch, vote and share; The Short Shorts KUDOS. 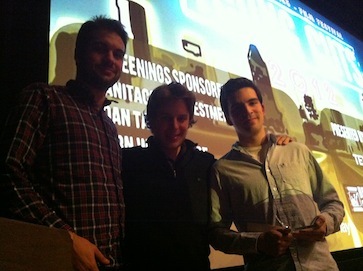 Watch all the 2012 YoungCuts Award Winners!